Product Details - Ingredients - hardened yak milk called churpi, include Cow milk, Yak Milk, Salt and Lime, Contain no preservatives or binding agents. Nutritional Fact - Crude Protein- Min 59.2%, Crude Fat- Min 5.2%, Moisture -Max 10 %, Fiber - Max 5.9%, Suitable- Small Dogs, Use -These healthy treats are bite-sized natural treats for dogs. Product Information - The Dogsee chew bars too big for your pet Looking for an appropriate size nutritional snack for them If yes, then you can try Dogsee Chew Multivitamin nuggets which are 100% natural, made of yak milk, which are the smaller version of the bars and are premium nutrition packed treats fit for your dog. The nuggets (churpi treats) are uniformly cut and are carefully tested for quality before being packaged. When you give this treat to your dog, you can be rest assured that you are providing your pet with high-quality nutrition and entertainment. They are prepared for your pup to enjoy the taste of Dogsee Chew bars for a shorter duration of time. Nuggets satisfy your dogs natural urge to chew and hence they will not chew on your furniture or shoes at home. 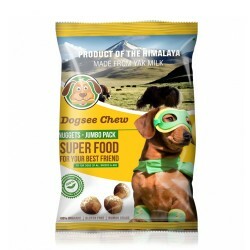 Dogsee Chew treats help in reducing tartar and are good for teeth and gums. The dog chews are fit for dogs of all ages and breeds. If your dog prefers softer treats, Dogsee chew Nuggets can be puffed in the microwave just to suit your needs. Benefits- Dogsee Chews nuggets are a perfect blend of natural ingredients and are made by the people we trust.Owing to its nutritious contents, the nuggets make your pooch healthy and strong.100% Gluten-free. Loaded with high protein content and less carbs. The fat content is less than 1% of the whole product.